Mostly you are used to buying store-bought custard, probably because you don’t know how super easy it is to make it from scratch. And also, if you have ever tried home-made custard you never want store-bought again! All you need is a couple of ingredients and about the same amount of time to make it yourself. It’s also an ideal recipe if you have some leftover egg yolks because everyone has a recipe that only needs egg whites at one point. Like this recipe for pavlova. REMOVE the marrow from the vanilla bean and add the marrow and bean to the milk. HEAT the milk in a medium-sized pan. 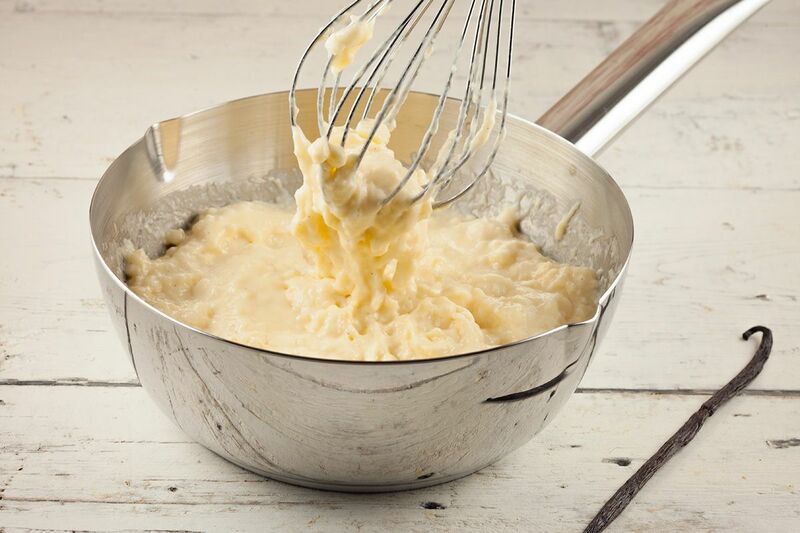 Meanwhile COMBINE the egg yolks, sugar and flour with a whisk. 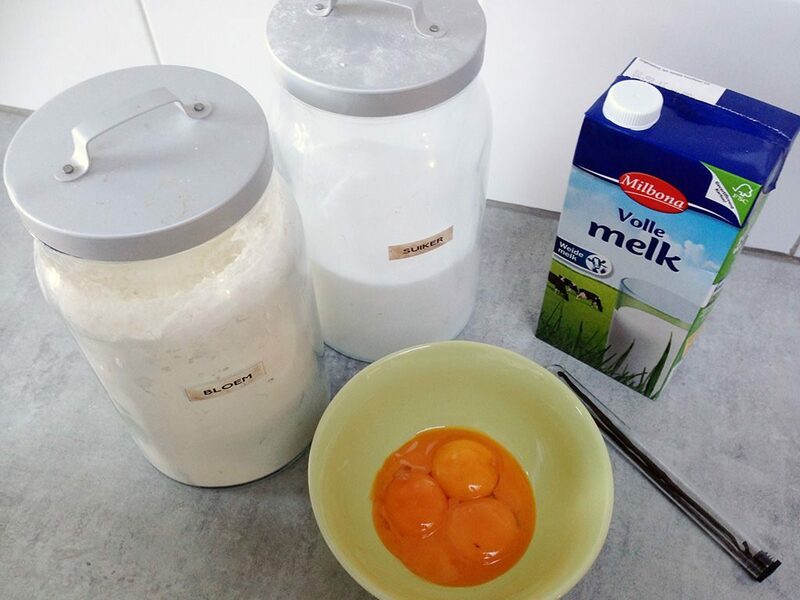 REMOVE the vanilla bean from the milk and ADD a bit of the warm milk to the egg yolk mixture. 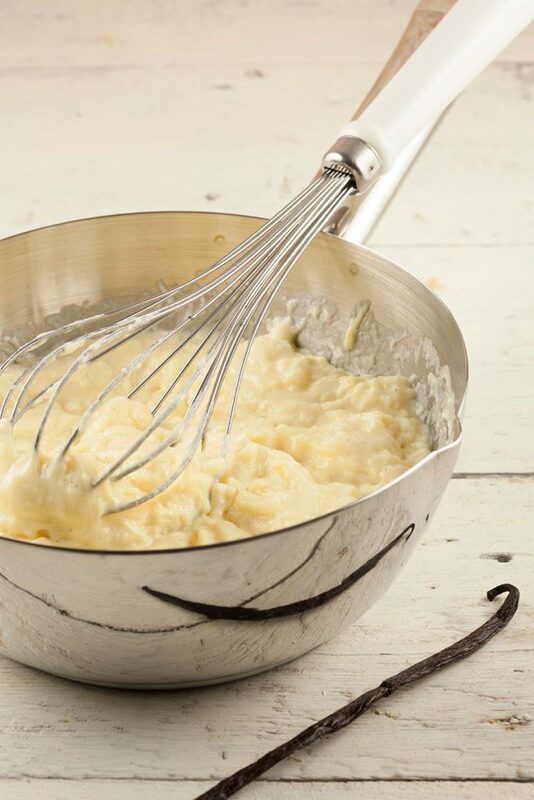 Immediately COMBINE well with the whisk to prevent it from creating lumps. ADD the mixture back to the rest of the milk and slowly heat it up. Keep on stirring to prevent it from burning, you’ll notice it will thicken after a few minutes. When that happens, pour the custard into a bowl and place a piece of cling film on top. Let it cool off completely and it will look exactly as thick as in the pictures. Now you can use this custard as a filling for lots of desserts, cookies or pies. Or as is with some whipped cream, you can of course also serve the custard while it’s still warm. I love vanilla pudding/custard I but don’t make it nearly as often as I do chocolate pudding. The thick version you’ve made here is what I think of as a pastry cream used to fill cream puffs, sometimes ‘lightened’ with whipped cream. Delicious stuff. Your yolks are such a bright orange colour. Yolks from local commercially produced eggs are a pale yellow in comparison in Ontario. Yeah this custard is thicker than the regular pudding, indeed to fill pastries. In Holland we have a “real” name referring to it (banketbakkersroom), instead of just the “common name” custard, but naming it custard does it haha. Oh really? I have never seen a pale egg yolk!